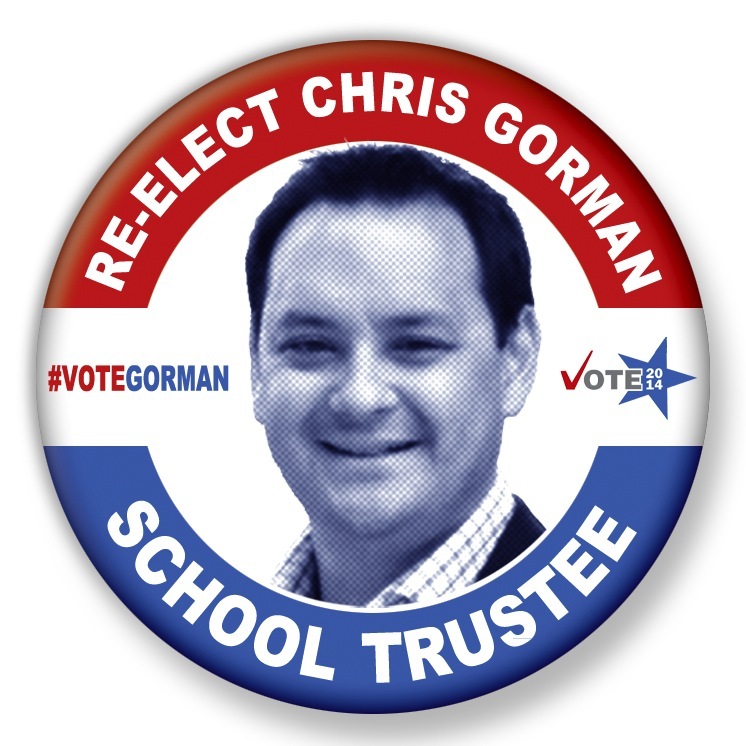 Chris Gorman is seeking re-election to the Central Okanagan Board of Education on November 15th to continue serving our community as School Trustee for the next four years. Chris is a learner, thinker, innovator, collaborator, and contributor - he understands our students, our schools, and the important role of Boards of Education in our democracy. He understands that education is fundamental to achieving our dreams - both individual and collective. It is a path that creates successful careers, strong communities, and effective democracies. Chris' personal education is a testament to the value he places on education. After receiving his Dogwood diploma, Chris earned his Bachelor of Arts degree at The University of British Columbia (UBC). Recognizing the importance of applied education, he completed a Diploma of Technology in Business Administration from the British Columbia Institute of Technology before receiving his Master of Business Administration degree from the Sauder School of Business at UBC. Chris has built strong relationships with local government officials and post-secondary institutions, and has directly advocated for students and our community to advance School District priorities. Chris understands public service. He has taken on professional and volunteer responsibilities, including serving as Executive Assistant to the Honourable Peter MacKay, PC, QC, MP when he was Minister of Foreign Affairs and working and volunteering with various political and not-for-profit organizations. These roles all focus on building a more resilient society. In May 2014, Chris was invested into the Sovereign Order of St. John of Jerusalem, Knights Hospitaller as a Knight of Honour in recognition of his public service. Through the experiences these roles have offered, Chris has developed an ability to bring clarity to complex issues and to navigate and acknowledge a wide range of perspectives. He has developed an appreciation for process and good governance, an understanding of public policy and advocacy, and most importantly, a capacity to make decisions based on the public interest. Chris was elected to the Central Okanagan Board of Education in 2011 and quickly proved that he could make a difference. He served as Vice-Chair in his first year as Trustee, Chair of the Finance and Legal Committee, and is currently Chair of the Human Resources and Staff Services Committee. He also currently serves on the District's Safe Schools Committee and the BCTF/BCSTA Group Life Insurance Committee. Chris has built strong relationships with local government officials and post-secondary institutions, and has directly advocated for students and our community to advance School District priorities with our local MLAs - Premier Christy Clark, the Honourable Steve Thomson, the Honourable Norm Letnick, and former MLA Ben Stewart - and Minister of Education, the Honourable Peter Fassbender. Working with teachers, parents, and students, Chris was active with his liaison schools - actively participating in the life of their schools, mentoring student leaders, and engaging educators to better understand the needs, interests, and ambitions of each school to better inform his decision-making as a Trustee. "Chris is passionate about making a difference in the lives of our students." Although he was criticized for not supporting the BCTF's demand for binding arbitration in the most recent labour dispute, he spoke out in support of teachers when they were accused of abusing their privilege. Chris stood with Central Okanagan teachers, parents, and students while others were silent. He consistently supported teachers, parents, and students' efforts to recognize student achievement through the creation of new and innovative initiatives, such as specialized Board authorized courses, Academies, and dual credit programs. Chris is passionate about making a difference in the lives of our students. Chris is a parent with one daughter enrolled in the Central Okanagan School District and another starting kindergarten next year. He has first hand knowledge of the trust parents place in the school system, the indispensable role of teachers, the value of education for the future of his children, and the frustrations that can arise in our collective efforts to meet the needs of all children in our School District. Chris has developed seasoned insight and experience that benefits teachers, parents, students, and our community. Let's keep him working as School Trustee so we can continue to stretch the boundaries and maintain the Central Okanagan School District's reputation as one of the most innovative School Districts in British Columbia.